Bouncing around in the Kidlitosphere today have been many lists of books that bloggers are looking forward to reading. I've found it really fun to read about what others are looking forward to. When I started making my list, it was really similar to many of the other lists out there. Susan Beth Pfeffer, Jeff Kinney, Sarah Dessen, Rachel Cohn, etc. etc. So instead of posting my list, I figured this would be a good chance to showcase the book I am most looking forward to and hopefully we can get a bit of buzz started about it. The number one, top choice book that I am looking forward to is one that I haven't heard a lot of buzz on. Albeit, it's an adult memoir, not kidlit, but it's going to be awesome. This I know. 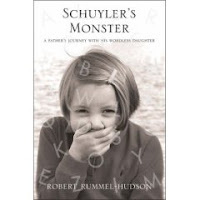 I've been waiting years (literally years) for blogger Rob Rummel-Hudson's book Schuyler's Monster: A Father's Journey with his Wordless Daughter. I've followed Rob's blog for a long time. What drew me to the blog was the story of his gorgeous, spunky daughter Schuyler (pronouced SKY-ler). She was born with a condition called Congenital Bilateral Perisylvian Syndrome, which is a neurological disorder that affects her speech. His book is about fathering a child with a disability, about constantly fighting for her, and about how she is constantly fighting to best her monster. I've always found Rob's writing to be eloquent and moving. I expect nothing less of his book. On Rob's blog you can find videos he and his wife have made to promote the book, posts about Schuyler's life, reviews of the book, and lots more. Check it out and maybe you'll fall in love with Schuyler the way I have, the way a whole community of internet friends has. February 19. The wait will be over.